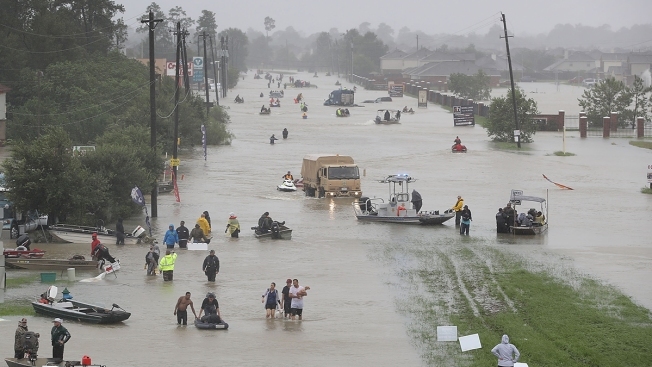 People walk down a flooded street as they evacuate their homes after the area was inundated with flooding from Hurricane Harvey in this August 28, 2017, file photo in Houston, Texas. "Not acting now to build flood resilience in Houston and Harris County will potentially be very costly in the future" according to the report compiled by Colorado nonprofit ISET-International, the American Red Cross Global Disaster Preparedness Center and Switzerland-based Zurich Insurance. The biggest example of this highlighted in the report was the flooding associated with the area's two reservoirs -- Addicks and Barker -- which has resulted in federal lawsuits in which thousands of homeowners allege they weren't aware of the flooding risks from the two damns. The report also discussed a culture that didn't warn people of the potential danger of flooding. It pointed to such things as not having to disclose a home's prior history of being flooded to using terms to describe extreme floods like a "100-year event" that don't help people understand that catastrophic flooding can happen more regularly. 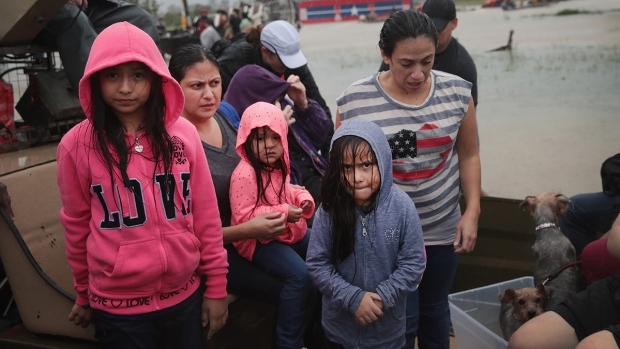 "There were so many people who had no idea they were in a flood risk area," said Karen MacClune, chief operations officer with ISET-International, which has done similar reports after other natural disasters around the world. The report also said the Houston-area can't only rely on infrastructure and engineering solutions to deal with flooding risk. Solutions should be broader than widening bayous and building more reservoirs but also have to include leaving more open spaces and restoring wetlands, according to the report.